And that can only mean one thing. It's time for Freebie Friday at Bugaboo Digi Stamps. Be sure to go to the website and get your free image here. 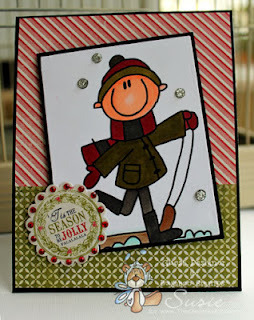 To make my card I used papers from Authentique's new line called Festive. 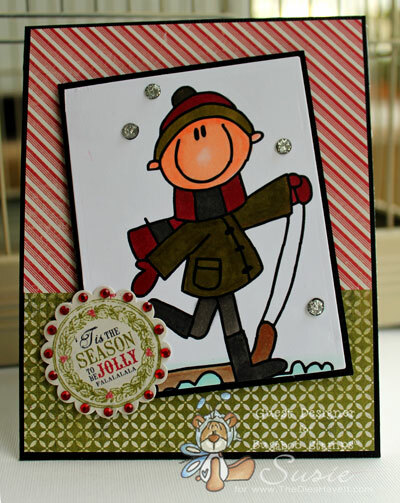 I colored this sweet Freebie Friday image using Copic markers and then cut him out with a Spellbinders die and matted the image with my Perfect Layers tool. My final addition was a sticker and some bling. Love the way this turned out. So that's it for today. Come on back tomorrow. I have another fun card to share with you. great job Susie! love the papers and sentiment!